Hot tubs enhance many homes across America, yet some people remain hesitant to purchase a unit of this type. They recognize a hot tub can be a great way to relax after a hard day at work and spend quality time with friends and family. Others understand these devices can be of great help in reducing pain and discomfort, and some find they sleep better after a session in a hot tub. In this article we look at the main things to bear in mind if you are thinking of buying a hot tub or, for that matter, a portable pool or spa. Many homeowners opt for a stationary hot tub, one that may be set up and left in place permanently. One option to consider, however, is a plug-and-play hot tub. Many of these units can now be moved from location to location, depending on the size and water capacity. They tend to be smaller than their stationary counterparts and, again depending on the size and water capacity, may be taken for camping trips or vacations, making them an option everyone should consider. Are you looking to purchase a hot tub, but want one that can go wherever you go? If so, an inflatable hot tub is exactly what you need, as they are lighter than many plug-and-play units. There are numerous types of hot tubs to select from, yet this style offers numerous other benefits also. This should be factored into the decision-making process. Once you determine you want a device of this type, however, you may feel overwhelmed by the choices currently available. How do you go about narrowing down the many options to find the one that is right for you? First and foremost, you need to understand the benefits of choosing a portable hot tub. Convenience obviously leads the list, yet price is another factor to consider in the decision-making process. Portable hot tubs tend to cost a fraction of what you would pay for a stationary device, and you don’t have to factor in additional expenses for installation. In many cases, the device can be plugged into a standard electrical outlet, thus no dedicated plug is needed, and the hot tub can be used right away. There’s no need to wait for delivery and setup when a portable unit is chosen, as most homeowners can handle this task without assistance. Most portable hot tubs can be up and running in as little as one hour, and putting the unit away when it is not needed isn’t challenging either. Individuals who rent truly prefer this option, as they aren’t investing a great deal of money in a property they do not own. When they move, the hot tub moves with them. One thing that buyers must be aware of is the added maintenance associated with a portable unit. The only issue that you must concern yourself with is regular cleanings of the filter, as the filter tends to be smaller in units of this type than stationary ones. Clean the filter weekly if the hot tub is used multiple times a week, as this helps to ensure the hot tub remains in optimal working condition at all times. For those who use the unit less frequently, less frequent cleanings will be needed. For example, if the hot tub is only used once a week, bi-weekly cleanings of the filter are recommended. Furthermore, portable hot tubs should have the water changed monthly, as this helps to reduce chemical buildup and overuse of the filter. As with any hot tub, the water must be maintained and sanitized. This requires stabilizing the pH, which helps to prevent damage to the liner. The unit comes with a set of instructions outlining maintenance tasks, and these instructions need to be followed exactly. Repairing an inflatable hot tub is a simple task. Patching holes will, typically, fix problems in as little as one day. Don’t hesitate to ask for hints and tips when purchasing the repair kit, as the retailer will be happy to share ideas on how to make the repair process easier and how to ensure it is done correctly. This type of unit plugs into any standard outlet that offers 110V power, allowing it to be used in a multitude of locations. No plumber or electrician will need to be called in, and the unit can be filled using the traditional garden hose. The water does take longer to heat than it would in a traditional, permanent hot tub, but most users find they don’t care, as the other benefits far outweigh this one drawback. No property modifications are needed when a plug-and-play tub is selected either. As long as the ground is level, the hot tub may be used. The Canadian Spa Company CSCHTQBC Quebec Plug and Play Spa is one option many consider. This spa is small, yet offers many of the features seen in a full-size hot tub. Three people easily fit into the unit, which plugs into a standard 15 amp outlet, and the device comes with 25 stainless steel jets. As it weighs 660 pounds, it can’t be easily moved for camping trips or vacations, yet it can be relocated when the time comes to move. In contrast, the Lifesmart Rock Solid Simplicity Plug and Play 4 Person Spa weighs only 268 pounds, making it slightly more transportable. This unit features 12 high therapy jets and a 12 volt light with blue and red lens caps. Thanks to the RockSolid Shell, this unit is highly indestructible. Inflatable hot tubs, or soft hot tubs are one type of plug-and-play unit that many choose to purchase. 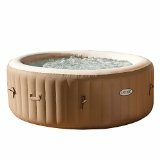 This type of hot tub is very easy to deflate and store, making it the perfect option for those with extremely limited space. The biggest concern with this type of unit is an accidental puncture. Thankfully, it’s easy to pick up a patch kit and store it with the hot tub. If an issue does arise, the unit can be quickly and easily repaired so the hot tub can be put into use again. When choosing any hot tub, consumers find they have numerous options to select from. For example, some hot tubs now feature an MP3 audio system complete with pop-up speakers. Seating varies by the model selected, and different pump sizes may be offered. The number of jets ranges greatly by the type of hot tub selected, with some units having only ten or 12 jets and others featuring 130 jets or more. In fact, some models now come with bonus features, such as a waterfall, so it’s best to compare numerous models to find the right one for your needs, and built-in LED lighting is another feature you may wish to have in your new unit. Comfort is a concern of many when researching portable hot tubs. Individuals find they can choose from many different models, with some accommodating only two people and others holding up to eight at one time. Seating in these models is very nice and soft, which can be an issue when a person chooses a stationary hot tub. The jet power is equivalent to that seen with a stationary tub, eliminating this concern. When choosing a portable hot tub, be sure to consider the warranty and service offerings. You want a company with an established track record of after-sales support and one that meets ISO 9001 standards. Finally, look for a company that offers instructions to prepare for the delivery of the hot tub and setup instructions that are easy to follow. Portable hot tubs may be set up in a variety of locations. Ensure the area is level, solid, flat, and slightly larger than the hot tub itself. Many choose to set up the hot tub on reinforced wood decking or poured concrete to ensure the weight of the hot tub, when filled with water, will be supported. In addition, the area needs to have adequate drainage for those times when the water must be emptied. A power supply needs to be conveniently located in the vicinity of the unit and should have a dedicated RCD-protected circuit. 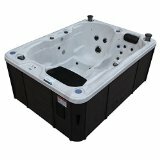 When choosing a plug-and-play unit, be aware that these hot tubs plug directly into either a 13 or 15 amp socket. Consider purchasing a portable two-person hot tub for your home or one that will accommodate more people. When you read inflatable hot tub reviews, you’ll see why so many are choosing to go this route. Thanks to the numerous benefits associated with these units, it’s a great way to add to your home without spending a fortune to do so. After you use your new unit the first time, you’ll wonder how you ever lived without one in the past!